BL models are our top products. 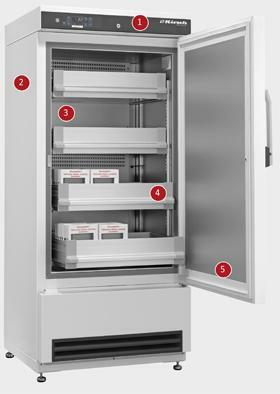 Each blood bank freezer features thick housing insulation and innovations as standard equipment. They are compliant with the DIN 58375 standard. KIRSCH is manufacturer. This enables us to develop our blood plasma freezer constantly. Each device consists of a robust housing and high quality components "Made in Germany". This guarantees reliability and a long economic life-time which in return saves your money. Potential free contact for alarm transmission. *Except FROSTER-BL-178, FROSTER-BL-180 and FROSTER-BL-650. We provide blood plasma freezers with temperatures of - 32°C or - 41°C. The housing is insulated with particulary good, environmentally-compatible pressure foam material to guarantee low energy consumption levels. The interior is made of smooth aluminium with a transparent protective coating. The aluminium container features shelve mountings in which the drawers can be hanged in. The distance of these mountings can be altered in 15 mm steps (these mountings are height-adjustable). The lockable door has a plastic magnetic sealing frame that is easy to replace. There is no overhang when the door is open. Door hinged on the right as standard, however this can be changed to the left at later date. A re-circulating air cooling system is integrated as standard and reduces the physically induced temperature drop and enables an almost constant temperature to be maintained in the freezers. Blood plasma freezers with -32 °C and -40 °C are available for plasma storage. The temperature is maintained automatically by an electronic, micro-processor controlled temperature regulator, even in the event of changing ambient temperatures. Rapid defrosting with thermal and temporal monitoring takes place automatically. The required plasma storage temperature is maintained thanks to the reversing of the refrigerant circuit. The standard equipment features of KIRSCH blood plasma freezers include an electronic switching, monitoring and warning device, a minimum/maximum temperature memory, an RS485 interface and a potential-free contact for connection to the central control technology.